I wanted to make an animal hat that was purple. So what animal is purple? Well, the Hippo! 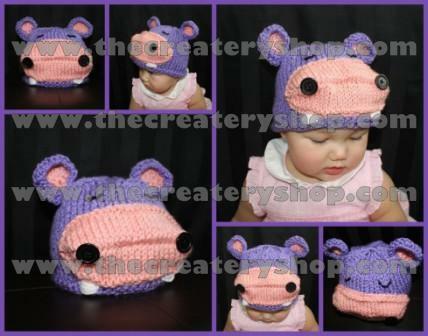 When I finished making this hat the name Lola came to mind and I am in love with Lola ever since! Step-By-Step Instructions with lots of color photos to help you along the way. Size: (0-9months, 9months to 2yrs, 2yrs+). You can go to my etsy site: www.etsy.com/shop/createry or click on the button below for pattern purchase. Enjoy Lola The Hippo!